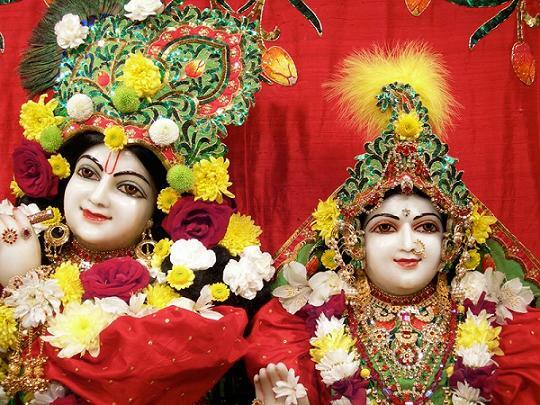 1) The divine couple, Sri Sri Radha and Krishna, is my life and soul. In life or death I have no other refuge but Them. 2) In a forest of small kadamba trees on the bank of the Yamuna, I will seat the divine couple on a throne made of brilliant jewels. 3) I will anoint Their dark and fair forms with sandalwood paste scented with cuya, and I will fan Them with a camara whisk. Oh, when will I behold Their moonlike faces? 4) After stringing together garlands of malati flowers I will place them around Their necks, and I will offer tambula scented with camphor to Their lotus mouths. 5) With the permission of all the sakhis, headed by Lalita and Visakha, I will serve the lotus feet of Radha and Krishna. 6) Narottama das, the servant of the servant of Sri Krsna Caitanya Prabhu, longs for this service to the divine couple.